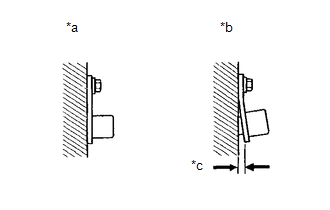 Refer to DTCs C1403 and C1404 (See page ). (b) Check the rear speed sensor installation (See page ). There is no clearance between the sensor and the rear axle housing. (a) Remove the rear speed sensor (See page ). (a) Remove the rear axle shaft bearing (See page ). (b) Check the rear skid control rotor. The rear skid control rotor is incorporated into the rear axle shaft bearing. If the rear skid control rotor needs to be replaced, replace it together with the rear axle shaft bearing. (c) Reinstall the rear speed sensor and rear axle shaft bearing. (a) Remove the skid control sensor wire (See page ). 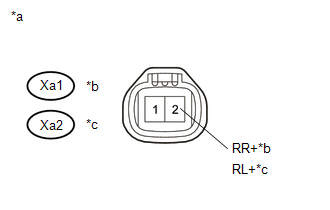 (c) Disconnect the S1 skid control ECU (brake actuator assembly) connector and the O3 and/or O4 rear speed sensor connector.